Born: 1890, St. Mary at the Quay, Ipswich. Died: 13th April 1915; age 25; Died of Wounds. Medals Awarded: Victory, British War & 1914-1915 Star. Relatives Notified & Address: Son of Mary Eliza Dawson (formerly Chamberlain), of 7, St. Clement’s, Church Lane, Ipswich & the late Henry Walter Chamberlain. 1891 21, Tower Orwell, Ipswich. George was 6 months old and living with his mother at the home of his maternal grandmother, aunt & uncles. Esther Chamberlain (nee Cattermole), 48, a Machinist- Tailoress, born Ipswich. Agnes Chamberlain, 25, a Machinist – Tailoress, born Ipswich. Walter James Chamberlain, 16, an Errand Boy, born Ipswich. Arthur John Chamberlain, 13, an Errand boy, born Ipswich. Edgar Baker Chamberlain, 6, born Ipswich. Mary Eliza Chamberlain, 24, a Machinist – Tailoress, born Ipswich. 1901 5, Church Lane, St. Clement’s, Ipswich. George was 10 years old and living with his widowed mother, brother & step siblings. Mary Smith, 30, a Laundress – at home. Walter John Chamberlain, 6, born Ipswich. Thomas Charles Smith, 4, born Ipswich. Florence Smith, 2, born Ipswich. 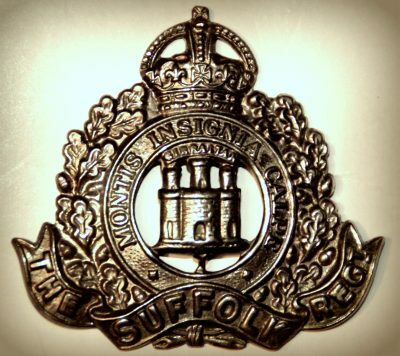 George was 20 years old, a Soldier ranked Private in the 1st Battalion of the Suffolk Regiment. Soldiers’ Effects to Mary Eliza Dawson – mother. George is also remembered on St. Clement’s Church WW1 War Memorial.